PRODUCT DESCRIPTION: Bromethalin Bait Blocks are a solid cake which rodents love. This is a new active ingredient which works quickly. Rodents will start dying within 48 hours; some even faster. This unique formula combines both a stop feed action, which prevents bait hoarding, and great acceptance. Comes in a resealable plastic tub which will keep bait fresh and new. 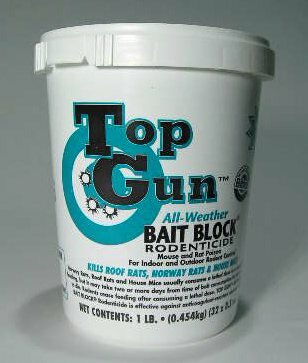 Top Gun is a professional rat rodenticide containing Bitrex. 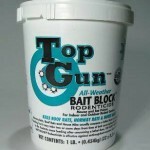 If your looking for a professional rat bait to control your indoor or outdoor problem, look no further than Top Gun. RATE OF APPLICATION: Depends on infestation. Be sure to have enough. Place 1-2 ounces every 10-20 feet for mice and more for rats. It kills rats. Works better than any other product that I have tried. I haven't had a chance to use this yet..But if it works as well as the other products I have purchased from here I'm sure its excellent!